Holy Cow! How did we get here?! It is week 5 of the Fall 2018 One Room Challenge and I can see the finish line. Almost everything is in it's place and I am so excited for the big reveal. The challenge has been so fun and well, a challenge for sure but we have almost made it. 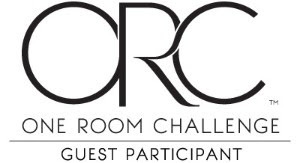 Tune in next week for the grand finale of posts as we close out the fall 2018 one room challenge! As always, don't forget to follow along each week to see the progress of each of the Featured Designers and Guest Participants!